O-ring sealed: These binoculars are sealed with o-rings, ensuring that no moisture, dust, or debris gets into the housing, disrupting vision from the inside of the lenses. These seals keep the path of vision cleared at all times and allow for users to have these binoculars out even in the rainiest weather conditions. Fog and waterproof: Argon gas purging makes these binoculars resistant to fog and waterproof. This allows users to be able to see clearly without the lenses fogging up in humidity or from body heat. Coated lenses: These lenses are coated for increased light transmission, which allows for clearer vision, color accuracy, and for the lenses to be anti-reflective. Regardless of sun glare, users of these binoculars will see everything clearly and in realistic color. This is especially important for those using this pair of binoculars for pleasure reasons such as hiking or bird watching. High density and extra low dispersion glass: These lenses are constructed with high density and extra low dispersion glass, meaning that all images seen will be high resolution. Users will be able to make out even the smallest details or movements in the distance. This feature benefits users who rely on accuracy and stealth, like hunters. Tethered lens covers: Lens glass can be protected when binoculars are not in use with tethered lens covers. This allows users peace of mind when traveling and needing to transport binoculars in a bag or when leaving binoculars unattended. The lenses themselves are already scratch resistant, but the extra layer of protection is a nice bonus. Lightweight: At only a little over 2 lbs., these binoculars are the lightest full-size pair currently on the market. This makes them easy to transport and wear comfortably around the neck with the included neck strap. It also makes them more comfortable to hold up and use for longer periods of time without arms growing weak or tired. ArmorTeck coating: The exterior lenses on these binoculars are protected with an ArmorTeck coating, which makes them resistant to scratches and oil for clearer vision. This will prevent oily fingerprints from affecting the quality of vision through the lenses. Rubber armor: The body of these binoculars is wrapped in a protective rubber coating. This makes them extremely durable and able to withstand significant shock or impact without any signs of damage. This rubber coating also gives the binoculars a non-slip grip so users are less likely to drop them, even in rainy or slippery conditions. Adjustable eye-cups: The eye-cups on these binoculars are fully adjustable. This makes them comfortable for all users despite anatomy. It also makes use of this product easy for glasses wearers, so they don’t have to impair their own vision before use of this product..
Center focus wheel and a locking diopter: This pair of binoculars features an easy to use focus wheel directly in the center of both lenses. This allows for both sides to be focused at the same time. However, if users have different vision in each eye then the lenses can be focused separately, and the difference can be locked in place for their later convenience. Tripod adaptable: These binoculars are tripod adaptable and can also be dashboard-mounted in a vehicle. This allows for convenient hands-free use and the ability to multitask. Every product on the market right now is going to have drawbacks. As far as the Vortex Binoculars are concerned the benefits far outweigh any negatives and make them more than just a worthwhile purchase. Field of view: These binoculars are high quality in every possible way, but could possibly benefit from a wider field of view. While the one on this pair isn’t at all bad, other pairs on the market have a wider field of view that some users might prefer. 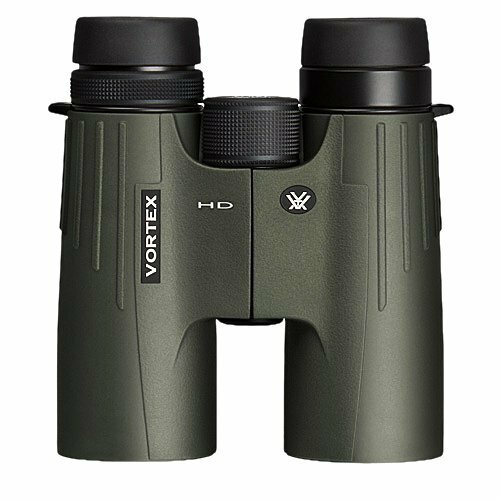 The Vortex Viper Binoculars are among the best currently on the market, and would be a great purchase for anybody that needs a pair. They aren’t overly complicated to adjust and focus, making them easy for people new to binocular use to handle. The adjustable eye-cups allow this pair of binoculars to be used comfortably by people wearing glasses, so vision doesn’t have to be impaired. Additionally, they are lightweight, durable, and high performance, making them the obvious option for users who need a rugged pair of binoculars to take out onto a rougher terrain. They are great for birdwatchers, hikers, hunters, and anybody else who often finds themselves in the great outdoors. No matter what weather conditions a user will find themselves in, they can always rely on these binoculars. They are resistant to even the heaviest rain and can be effective even in low light conditions.